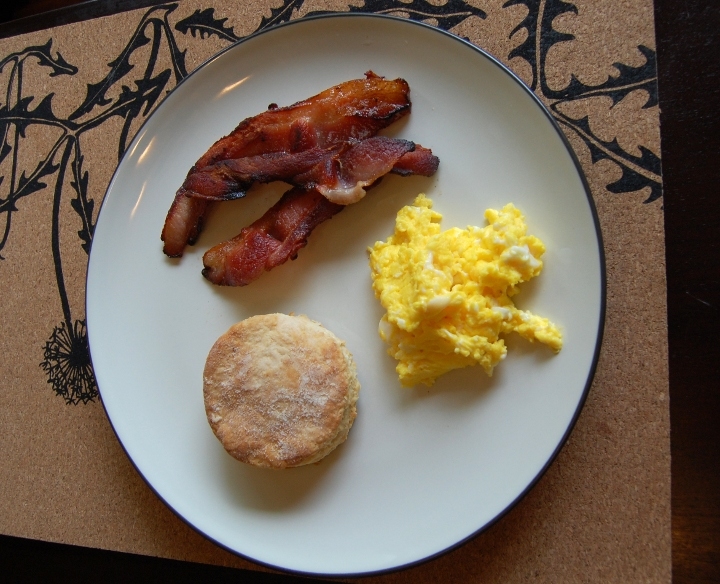 The above picture is our Sunday breakfast: homemade bacon, fresh-baked buttermilk biscuits, and scrambled eggs from our own chickens. Having chickens is great, so far. It’s not exaggeration to say that they are the best eggs I’ve ever eaten. I don’t even have to add salt when I cook them. I like to fry them over-medium and eat them with toast, or poach them for a bistro salad. I’ll be making ice cream with them in the near future. This is on top of the questionable practices of many egg operations, which some people consider animal abuse: chickens are shoved together in cages so small, they can’t stand up or move their wings. On top of that, they’re often shot with antibiotics, hormones, and other drugs. Contrast that to my hens. They have giant cages, they get to roam around the yard, and they get tons of treats and attention. The point is, I haven’t had to worry about the egg recall at all. And I’m starting to see another benefit to growing your own food, besides increased quality and saving money. It reminds me of the e. coli outbreak in Spinach that happened in 2006. Everyone was upset because they couldn’t eat spinach, but I grew my own, so I didn’t have to go without spinach and I didn’t have to worry about e. coli, either. Earlier this year, there was a basil shortage, but I grow my own, so I had more than I knew what to do with. The price of beer is going up like crazy, but my husband makes excellent beer that costs under $1 a bottle. Our food system seems unstable sometimes, which is why it’s great to have your own source of food. It’s nice to have the peace of mind when you sit down to breakfast that you know exactly where your food came from, and what went into it. Great post! I love the piece of mind that I get from growing my own food. The effort it takes is 100% worth it! Thanks! I’m glad you feel the same way. Sadly, our county has a restriction against raising chickens anywhere considered residential. Which is basically everywhere that isn’t an actual farm. It’s quite upsetting. I’d love to raise a few chickens for eggs. That’s too bad, Shawn. You should complain. Chickens are not messy or loud, so there’s no reason they can’t be in any residential neighborhood.